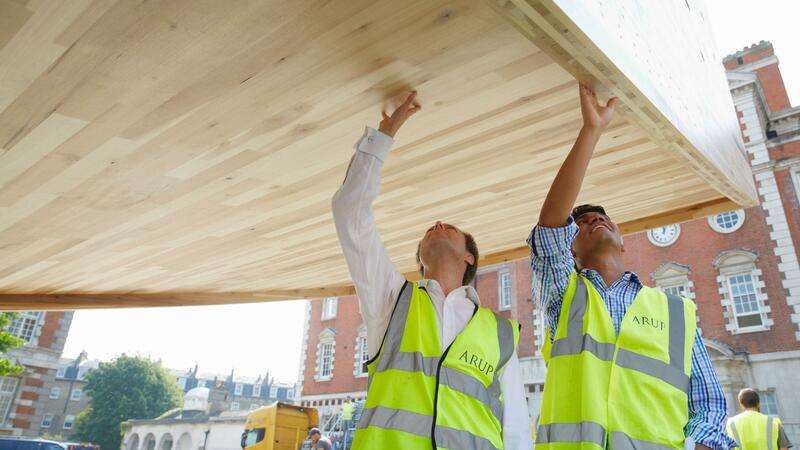 Andrew Lawrence, Arup’s global timber specialist says ‘This is by far the most complex CLT structure that has ever been made. 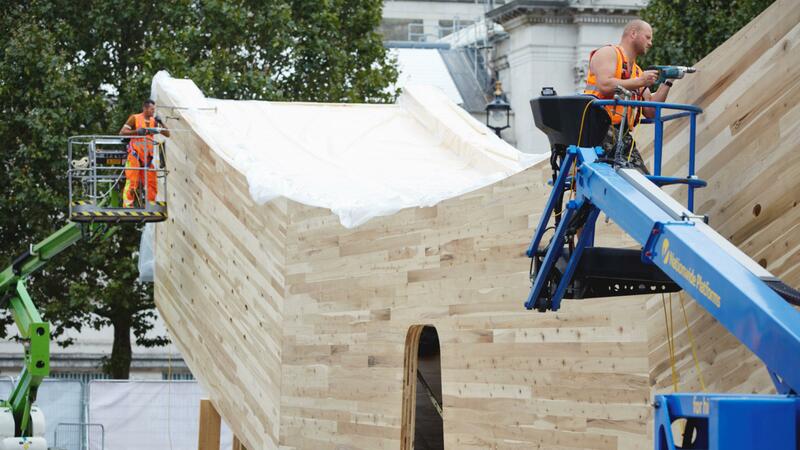 It was a massive challenge in terms of scale and engineering as well as a demonstration of just how exciting and beautiful a building using CLT can be’. Not only does it have a double cantilever, but the entrance door in the centre of the structure is placed exactly where the stresses are highest. 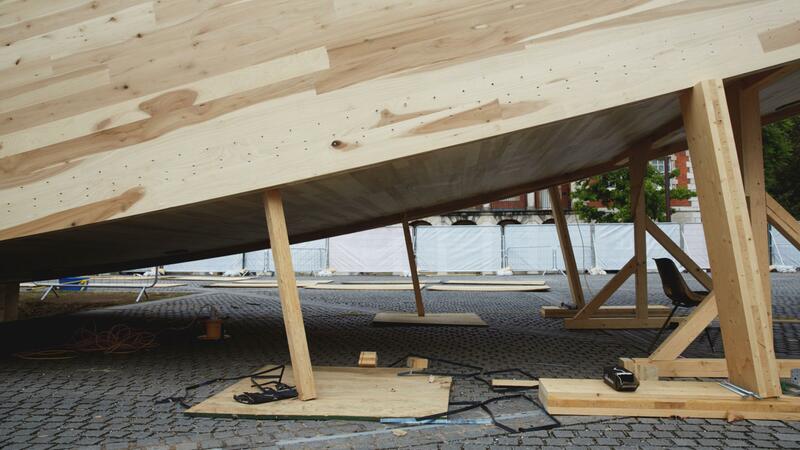 Solving these challenges has useful lessons not only for this structure but also for all future CLT buildings. One of the first challenges for Lawrence was determining the properties of the American tulipwood that the project is using. 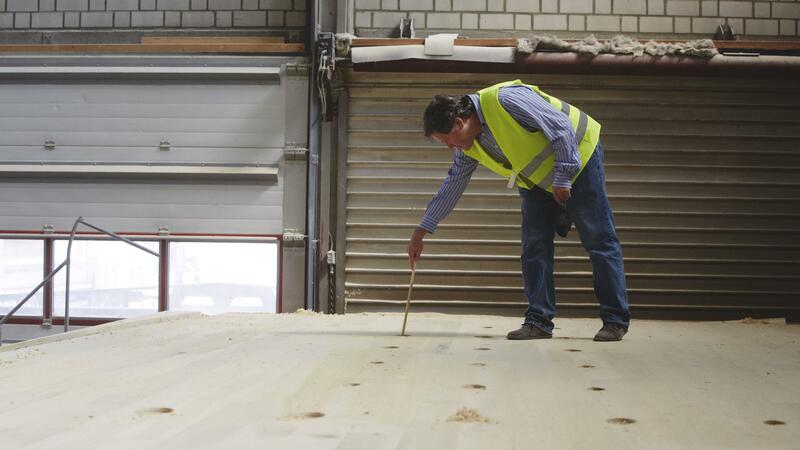 The strength of the CLT is derived from testing undertaken on 100 full size planks of tulipwood 15 years ago. The design had to take some very demanding circumstances into account. The shape and the loadings mean that it is in tension at the top over the door and in compression through the floor under the door. In addition to the position of the door, there was the way that The Smile sits on its wooden foundation. This is partly buried in the ground, to minimise the visual impact and, for the same reason, is as small as possible, while not allowing it to be so small that the structure could roll over, lifting the foundation which is weighted by the use of steel weights within the wooded box. Another consideration relates to the behaviour of visitors. The designers had to allow for the fact that all the visitors could be at one end of the structure at one time – another design consideration was that everybody might stand to one side, tending to turn The Smile on its side. The structure also had to be strong enough to resist ‘lozenging’, the tendency to distort from a square cross section to a rhomboid when the wind blows from one side with a force equivalent to 10 tonnes. Therefore stiff moment connections have been introduced at the roof to wall junction to limit the amount of lozenging. All the connections were achieved with self-tapping screws, about 400 mm long and very carefully positioned. Another challenge comes from the sheer size of the elements. 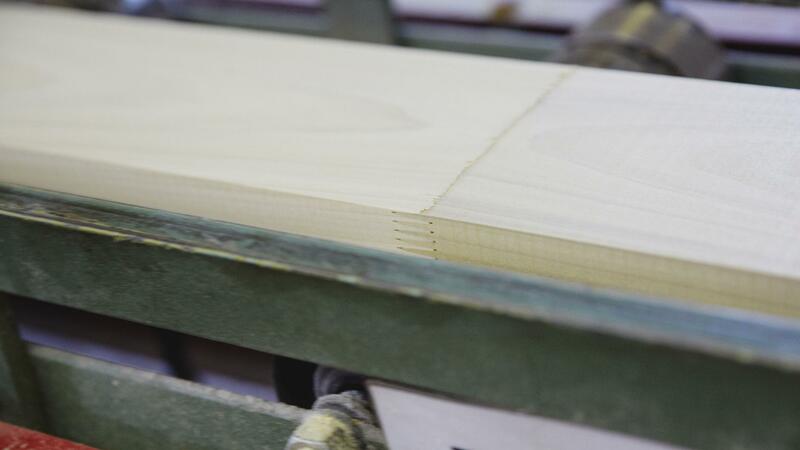 CLT lends itself to being made in large pieces and in this case it is essential, as there could not be a join in the centre, where the structure is most highly stressed. After all this work and effort, assembly was relatively simple, ‘like a piece of IKEA furniture but on a much larger scale,’ said Lawrence.